A blend of high quality green tea with sweet cherry flavoring & subtle rose hints give the tea a wonderful exotic character. 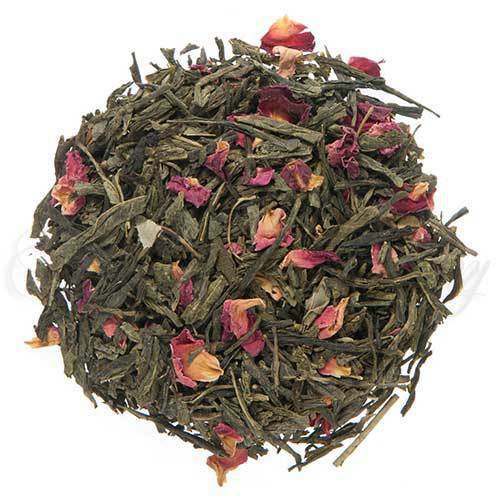 Sencha Kyoto Cherry Rose is a house favorite and always a very relaxing tea. Luxury Ingredients: Green tea, Rose petals, and Natural flavors. Hunan Province produces some excellent Japanese style green teas. Early in the new season the tea is a bright emerald green and has the best flavor noted by a spring fresh character with pungency and body. [In Hunan the tea starts growing about March 15th, and between then and the end of April the quality is very good. Once you pass April, the quality plummets on account of the volume of leaf taken in and the bushes growing too quickly. Our policy is that we only buy our China tea requirements from tea grown between March 15 and April 15 – you will taste our quality and dedication to better tea when you compare our tea with similarly graded teas]. Sencha is commonly used in Japanese tea ceremonies marking events of personal importance. In this type of ceremony it is the ritual that is of paramount importance as the individual is being acknowledged. Flavored tea is a relatively new phenomena and combining flavors with roses and Japanese style green tea is almost considered ‘Avant Garde’ by our Japanese friends. Kyoto is the cultural center of Japan. Several centuries ago Kyoto was the religious capital of Japan. The relics of this past are evident throughout the city. Beside the multitude of temples that dot the city, and the wonderful parks where religious scholars once walked, the city has more the 1000 Torjii – those typical gate/arch structures that one associates with Japan. The Torjii are large with the top shaped like a curved samurai sword (respect) and the two pillars are solid and stately (well-being). During the springtime this area of Japan is ablaze with the new season cherry blossoms and the air is filled with sweet aroma. (The rose petals in this blend are intended to simulate these delicate cherry blossoms. The flavor is reminiscent of the beautiful smells that waft on the springtime breezes.) It is little wonder that this ancient city has a very high ratio of tearooms and this tea was created to honor (very important in Japan) this wonderful time of the year.